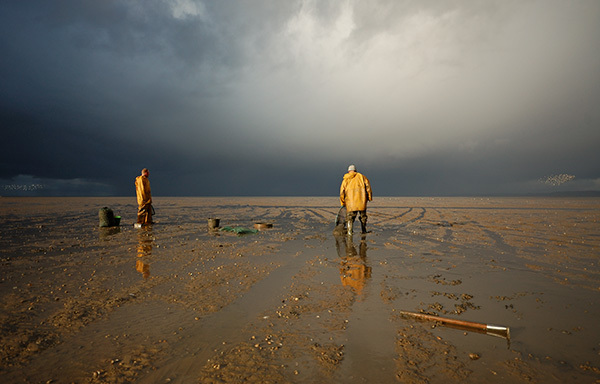 Cockle Pickers working at low tide, Morecambe Bay in the North West of England . The Bay is notorious in the UK for the danger and speed of the incoming tides and quicksands after 23 immigrant pickers who didn't have enough local knowledge of the tides died in 2004. The weather was very dramatic as you can see.....within 5 minutes of getting back to the car we had one of the heaviest rainstorms I've ever seen. I was glad I wasn't still out there in the bay with hours to go before the end of my shift.